Muv stand-up adjustable height desk. Safco product feature. Take a stand against sitting. Why? Because 77% of time spent at work is sedentary. Standing can help promote a healthier working lifestyle and potentially lower risk of some diseases. An estimated $190 billion is spent annually on obesity related illnesses alone. Muv stand-up adjustable height desk. Adjustable height from 35" - 49". Fully retractable keyboard shelf. Lower shelves offer space for peripherals and other work space essentials. Four wheeled base provides mobility and flexibility across the workspace. Front locking casters provide stability. Decorative side panels hide unsightly computer cables. Take a stand with Muv. Can also be used with Safco active leaning seats and other bistro and extended-height seating options. Create a healthier, more flexible work space with the Muv stand up desk from Safco. The Safco Muv stand up work stations help you stay more awake and engaged at work! 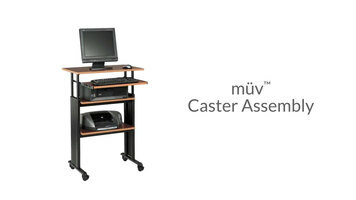 Watch this video to see how easy it is to install casters on your Muv! 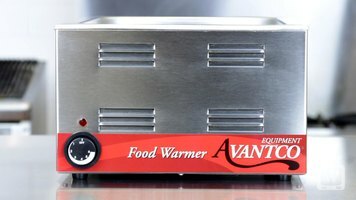 Check out this video to learn about the convenient features of the Avantco W50 electric food warmer! Not only is this food warmer easy to operate and clean, but its low cost and portability make it the obvious choice for any restaurant or snack bar.